Amtek Precision Engineers Ltd: Established in 1984, Totnes based, Amtek Precision Engineers Ltd has grown rapidly over the past 28 years to become one of the UK's leading mould toolmakers. The company specialises in the manufacture of high volume, multi-cavity injection moulds and the production of complex CNC machined components. In addition to Amtek Precision Engineers’ expertise in the field of mould tools, the company also operates a state of the art CNC machining facility. This well equipped resource enables the efficient manufacture of a diverse range of components for demanding industries such as the aerospace, medical and the oil and gas exploration sectors. Reflecting the growing demand for Amtek Precision Engineers’ output, the company is currently in the middle of an investment program that will result 250K being spent throughout 2012. Given the company’s stringent quality standards, a vital element of this investment strategy was the purchase of an advanced Venture, CNC Vision Measuring System from Baty International. Mike Lawes, Amtek Precision Engineers Ltd, Production Supervisor explained. “As premium quality products, short lead times and competitive pricing are the key requirements of our customers, we recently invested in additional advanced CNC Machine Tools. To keep pace with our increased output, we recognised the need to purchase an extremely precise CNC Vision Measuring System, that was capable of undertaking high-throughput, rapid measuring routines. “After having demonstrations of several alternative systems, it became clear that the Venture Vision Measuring System from Baty International best suited our challenging needs. Besides satisfying all of our criteria, surprisingly the Venture was also very competitively priced when compared to some of the other offerings. “In addition to having a number of advantages over its competitors, Baty’s Venture was also the easiest system to program. Since the Venture’s recent installation, we now have the ability to quickly retrieve stored DXF files and compare them to the part under inspection. Also, the machines ability to recall programs for repeat jobs and to run them in a CNC mode is a real advantage when measuring multiple components. After pressing the start button, the Venture is able to perform very accurate, complex measuring routines on large batches of parts without operator intervention. Based in Burgess Hill, West Sussex, Baty International is one of the world's leading manufacturers of Optical Profile Projectors and Co-ordinate Measuring Systems. Building on decades of experience in non contact dimensional measurement, Baty has been a major innovator in the field of advanced Camera based Vision Measuring Systems since the early 1980s. 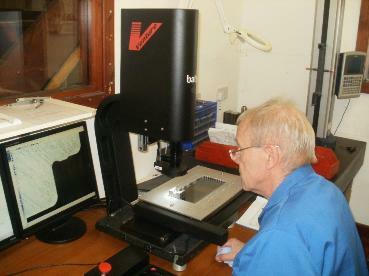 The Company’s highly successful, 3 axis Venture range includes both manual and full CNC systems. Baty’s powerful Fusion software boasts full 3D functionality allowing measured parts to be dimensioned in all three projections resulting in true 3D results. Venture CNC models are able to completely automate the inspection process, resulting in advanced features such as scanning and ‘best-fit’ being achieved both accurately and quickly. Venture uses a straightforward teach and repeat process for CNC programming, by simply measuring a part, a full CNC program is created, this program can then be used to measure subsequent parts when required. In addition to a graphical representation of the measured part, detailed reports can be instantly created showing the feature name, nominal dimension, actual dimension, error and upper and lower limits. In addition a green pass or red fail label for each measured dimension is available in a tabulated format. Geometric tolerance details can also be displayed along with a thumbnail view of the part and batch/customer information. These reports can be output directly to Excell Spreadsheets, with additional SPC data analysis. Venture models are available that incorporate both Baty’s non-contact system and tactile probing. Measurements from data points taken using a touch probe can be combined with those taken using video edge detection, resulting in reduced inspection times. Venture can be supplied with a changer rack installed so that probe modules fitted with a variety of pre-calibrated styli can also be used in the same inspection. When a change of stylus is required, the system automatically puts the current probe module back in the rack and picks up the next to continue the inspection process. For more information on Baty's range of Vision Systems click here.